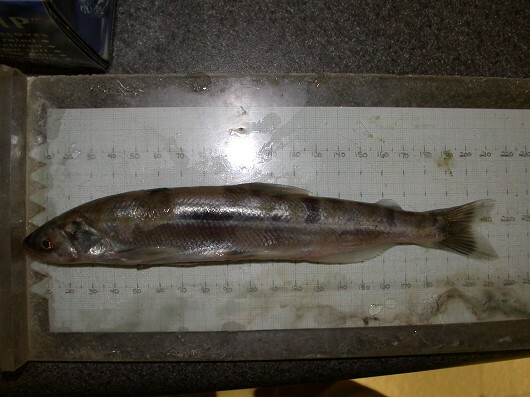 Eulachon, male, caught in rotary screw trap on the Sacramento River at Knights Landing on 1/27/2006. Photo by Michael S. Brown, California Department of Fish and Game. Note: Gonads were removed. Eulachon, male, caught in rotary screw trap on the Sacramento River at Knights Landing on 1/27/2006. Photo by Michael S. Brown, California Department of Fish and Game. 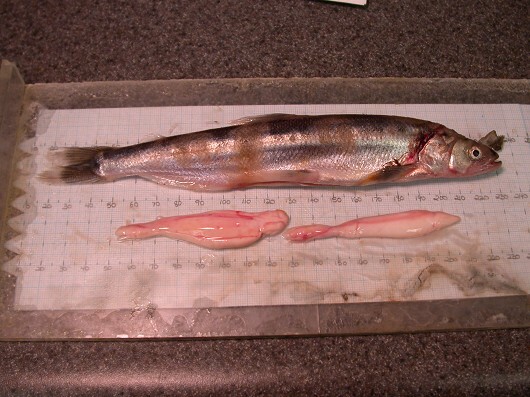 Note: Gonads were removed and are shown below the fish. Eulachon are anadromous and spend the majority of their lives in the ocean and return back to coastal freshwater streams to spawn and die. Most Eulachon live 3 years though some fish are actually repeat spawners and live to age 5. When Eulachon first hatch, the larvae are washed downstream towards the sea, and they don’t become free swimming juveniles until they have reached a total length of 50-80 mm. In the ocean Eulachon live and feed in both shallow and deep water areas, focusing their diet on copepods, euphausid shrimp, and other crustaceans. Most Eulachon reach sexual maturity after 3 years and enter their natal streams between December and May. In California spawning starts in mid-March and lasts through May in the northern part of the state. Spawning migration occurs in a narrow window of 4-8°C, and may slow or stop if the water temperature rises above or falls below the favorable range. Eulachon rarely swim further than 10-12 km upstream, and males are typically first to arrive at the spawning grounds which are typified by gravel, sand, wood, and other debris. Actual breeding occurs on a large scale at night when many females deposit an average of 25,000 eggs each. The eggs have two membranes, the first of which ruptures on the substrate to anchor the remaining embryo to the streambed. Embryos generally hatch in 2-3 weeks, with a greater incubation time for eggs in cold water.